I don't use this personally, so I don't know about the license. Anyone want to update the database? infimum wrote: v6.6 is out. Easy to use, simple interface nobody's going to get confused by. Reminds me a bit more of an actual dictionary. Has ctrl+alt+w to look up words or selecting and right-clicking while holding control. Very easy to remember. Weird license, asking me how many flights the user has taken. I understand and definitely support the point behind this, but its still odd. Strange color-coded tree view took some getting used to, but is quite powerful. Love the tabs, anagrams, and quick look at Synonyms, Antonyms Hypernym (I had to look that up ... it's a word that's more generic than the given word), and Derived words. Awesome. They both are similar in concept, but very different execution. As far as I was able to tell, one isn't better than the other. Good news. I've been testing a somewhat related "Grammarly" (a language/spellcheck plugin) for Firefox with mixed success. 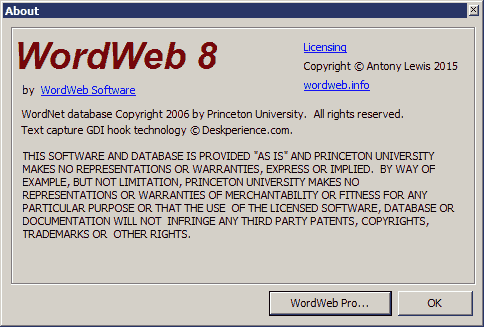 I've been drafting up a fair amount of text that makes me want to come back to WordWeb in the days ahead. Continuing on from the posts made in the comments section I had always assumed the license check about the flights was purely about presumed income levels, but it turns out it's more to do with some goal about reducing emissions? Certainly unique among them. It used to be, if memory serves me right, that Arachnophilia (a former favorite Windows-only portable HTML editor, now ported exclusively to Java since v5.0) had a slightly odd "About" box extolling its Careware licensing (https://arachnoid.com/careware/; see also Wikipedia's entry on the term at https://en.wikipedia.org/wiki/Careware). 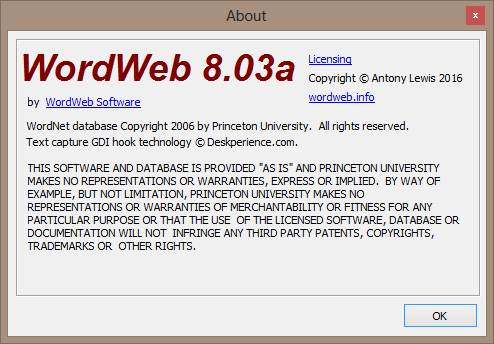 Notwithstanding, the Arachnoid homepage also includes a definition of freeware worth reading: https://arachnoid.com/freeware/. That you will not have to pay for the program, in any way, ever. That the program will turn out to be what its description says it is. That the program will meet at least some of your needs. That your privacy will not be invaded. You must read the documentation and FAQ list before asking a question. You may not demand new answers to questions already covered in the FAQ list or the documentation. You may not demand customer service or one-on-one instruction. You don't have the right to demand program changes to suit your personal tastes. There's just one - you can stop using the program. You cannot complain about it as though you paid for it, because you didn't. Very interesting. Both his "careware" and "freeware bill of rights" are fantastic, not because I agree with them but because he put a LOT of time into that. EDIT: And for something that's kind of the opposite, you can see Google's "ethical" approach to user data collection as some kind of social improvement effort as portrayed "Selfish Ledger" video. The developer of Wordweb, Xenu, and Arachnophilia have very different good ideas they're trying to encourage and make public, while Google makes this very creepy justification for surveillance capitalism. It's a strange world.